Charlotte Gardiner Academy of Performing Arts. Charlotte Gardiner was a teacher at Newcastle’s Royal Grammar School who ditched plans to buy a house in favour of starting her own performing arts business. She used the money that she had saved to recruit three members of staff for her children’s performing arts summer camp which was launched over the summer holidays. Charlotte contacted us looking to use our printing services to create printed hoodies, printed T-Shirts, polo shirts, caps and backpacks for herself, her staff and also the children who were looking to take part in her Performing Arts project. 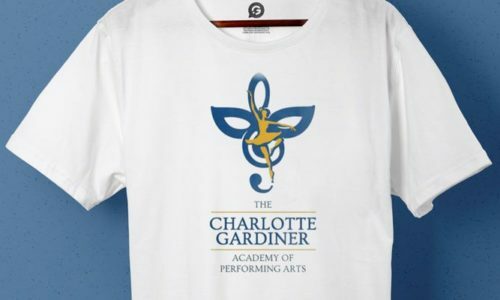 Each of the designs had to feature the Charlotte Gardiner performing arts logo on the front. As the logo was the same design, we opted to use Cad Cut Vinyl printing as we were easily able to create the one colour design and produce all of the printing in a short amount of time which to ensure that everyone received their printed garments in time for the opening of the performing arts academy. Once we had received the designs and confirmed the printing technique with Charlotte we send the visuals to our printing location and created the designs on multiple garments and accessories. We agreed to create different printed kids T-Shirts as well as polo shirts for the staff, printed hoodies and printed accessories such as caps and backpacks. Once the printing was completed we arranged for the order to be delivered directly to Charlotte to receive the order and she was delighted with the finished results.